1.) 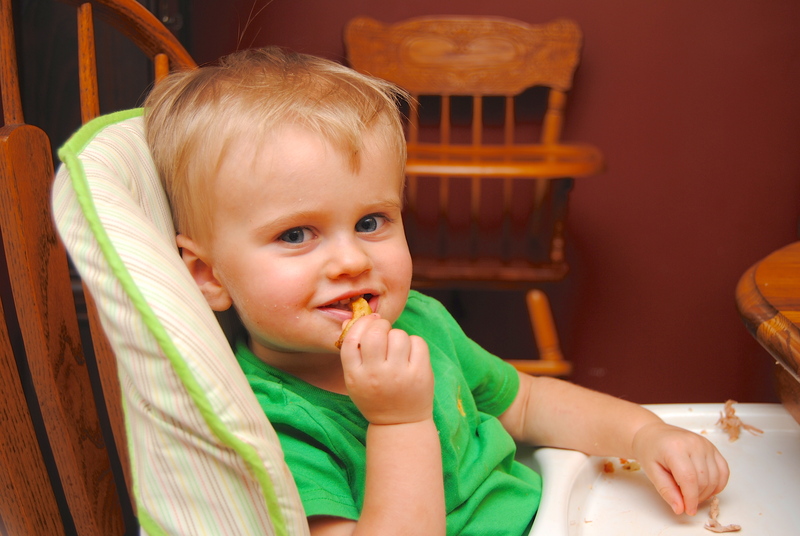 Never lead with fries – No matter how good of an eater you’ve got, don’t lead with the fries. It will be hard to near impossible to get them to eat anything with any greater nutritional value once they’ve got a yummy, greasy, salty fry in those chompers. You want some chicken? [shakes his head no] You want some broccoli? [shakes his head no] You want a fry? Yeah! Well crap. 2.) Sometimes you have to break the rules – So if you’ve read my posts about food, you may have gathered that I don’t like highly processed artificially flavored food colored anything. I don’t buy it, I don’t eat it myself, I don’t feed it to my kids. However, sometimes you’ve got to break the rules. Perfect example – the haircut. Beckett is still not too thrilled with the whole idea, especially when they have to hold his head to use the clippers. If his mood is not right, the kid will freak out. Solution? A lollipop. Not the all-natural real fruit ones that the mom I was when there was just one used to carry around, but a good ole fashioned bright red DumDum lollipop. Well, rules were made to be broken, right? 3.) Miracles happen every day – Just when I thought it wasn’t possible, my boys proved tonight that miracles do exist. They actually spent 20 minutes playing happily and quietly together. There was no hitting, no biting, no hair pulling. No screaming, no crying, no whining. 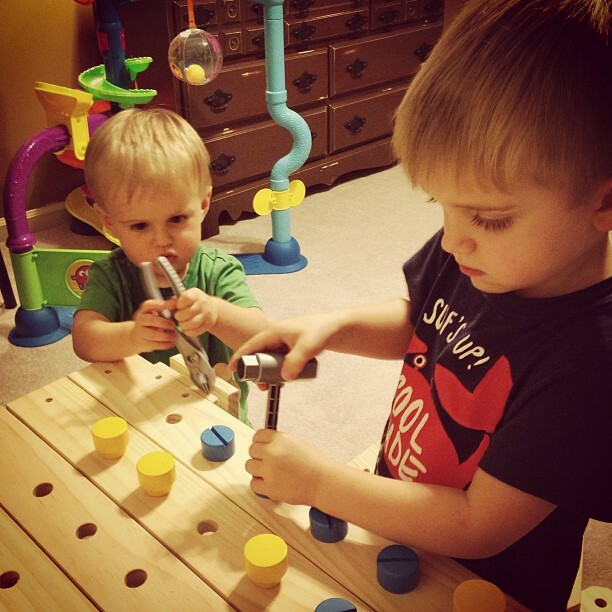 Just two little boys playing at their work bench. I was folding laundry in my room when I had that eerie feeling that things were too quiet. I walked to Beckett’s room and there they were being so sweet it actually put a lump in my throat. I stood at the door for a couple of seconds and they didn’t even notice I was there. So of course I had to go get my phone to document the event (the real camera was downstairs and I really didn’t want to miss this!). So don’t give up hope – even if it’s just for a short time, miracles do happen and the kids can get along. 4.) Keeping calm is contagious – I’ll be the first to admit that I don’t always keep my cool. It’s not always anger – sometimes it’s stress, sometimes it’s frustration, sometimes it’s anxiety. But I’ll tell you, the kids pick up on it. They can be like little sharks sniffing out blood and then attack when you’re at your weakest. It’s brutal. Now on the other hand, keep cool and they sense that too… and catch on. It is amazing what a nice night you can have with your kids when you make an effort to stay calm and don’t stress. It’s like they magically turn into loving little children who want to please and behave. 5.) Be nice or the kids will tell on you – Backdrop to this conversation… I would not turn around while driving to get Brogan’s milk that he was tired of holding. Brogan: I’m going to write you a note home because you’re being mean! Me: Who are you going to send it to?